In his first week as Tennessee’s 50th governor, Bill Lee issued four executive orders, the first cementing his commitment to the 15 rural Tennessee counties that are economically distressed. Others addressed ethics, transparency and nondiscrimination in employment. He was following a tradition among the state’s recent governors who have started their terms with executive orders. The tradition also extends to governors across the country. “Governors like to have a couple of executive orders ready to go in the first couple of days” to show they are taking action and to set the tone for their administration, says Kristoffer Shields, assistant research professor, historian and program manager with the Center on the American Governor, Eagleton Institute of Politics at Rutgers University. Executive orders are useful in a number of ways, he continues. A governor can signal a policy priority through issuing an executive order, Shields says, and there may be political reasons. For example, when incoming and outgoing governors represent different political parties, the incoming governor might use an executive order to emphasize the change. That doesn’t apply in Tennessee, where both Lee and his predecessor, Bill Haslam, are Republicans. Executive orders apply only to the executive branch of state government and can be altered or rolled back by future executive orders, Shields adds. In Tennessee, 22 state departments report to the governor, including agriculture, correction, economic and community development, education, financial institutions, health, human services and transportation. Executive orders on ethics, transparency and nondiscrimination are popular among new governors assuming office, Shields says. Lee’s fifth executive order, issued Feb. 1, places a 90-day freeze on new regulations by executive branch departments, in the interest of promoting job growth in Tennessee. 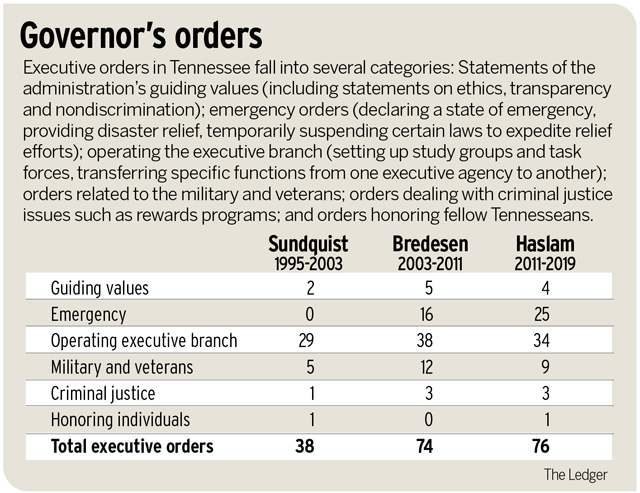 Under the Tennessee constitution, the governor is vested with “supreme executive power,” including the power to issue executive orders. The state Legislature also has weighed in on executive orders over the years, as when it required the governor to issue executive orders announcing transfers of government functions between executive departments. “I think the public gets confused about the appropriateness of executive orders because executive orders get politicized at the national level and distorted by political pundits,” Sen. Brenda Gilmore, D-Nashville says. “Executive orders, in themselves, are not bad if used within the limits of the constitution, court decisions and codes. Gilmore says she approves of Lee’s first four executive orders, especially the order on nondiscrimination in employment. She is taking a wait-and-see approach to the fifth order, the regulatory freeze. “Republicans usually campaign on cutting regulations and issuing regulation freezes,” she says. “However, there are regulations that keep our water safe, our children safe, our natural resources and wildlife preserved, our air clean, and our state a healthy and clean place to live. Although the executive order does call for a freeze on new regulations, I will say it does give exceptions to new regulations that benefit the health, safety and welfare of Tennesseans.